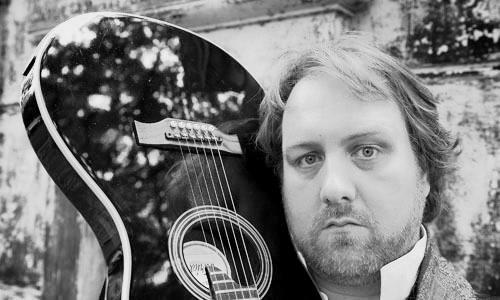 CD Review: Mitch Benn & The Distractions – Breaking Strings. Mitch Benn, probably best known as the musician who provides the funny songs for BBC Radio 4’s The Now Show, has released his seventh studio album. And what a release it is. Although Breaking Strings is ostensibly a comedy album, it transcends the genre to incorporate rock sensibilities. Benn has always been willing and able to tackle serious topics; “Happy Birthday War”, from 2008’s Sing Like an Angel album, questioning the conflict with Iraq being a case in point. Although most tracks satirise some thing or another, four out of Breaking Strings’ fourteen tracks have a markedly serious tone. The album is bookended by tracks that aim to defend two British institutions. It opens with “I’m Proud of the BBC”, a list-song inevitably reminiscent of Billy Joel, that celebrates the public service broadcaster at a time when it is receiving particularly strong attacks from the tabloid press (yes, Daily Mail, you have lost the right to the label ‘mid-market’) and private-sector-friendly Conservative-led government. Benn laments how the BBC is often unable to defend itself as comprehensively as it should, and has made considerable effort to point out on Twitter and in interviews that the song was written without the Corporation’s knowledge or, importantly, funding. The catchy polemic has some dextrous rhymes (Antiques Roadshow/David Attenborough) that incite chuckles, and addictive hooks that incite repeated listens. As the album nears its end, it gives us a beautiful song that defends the role of the public library in literacy, intellectual and emotional development. From the anecdotal opening in which he reminisces about his father’s love of reading, to the closing instrumental, in which the guitar almost pleads to “let the public keep their library”, the song is emotive stuff. I wonder how many tears are shed as he performs the song as part of his current Ode Warrior tour, which stopped off in Stockton in February to a relatively small but highly-appreciative audience. Between these is “He Don’t Look Right”, a warning about the superficiality and dangers of judging people by their appearances that is obviously inspired by the harsh treatment some tabloids gave last year to the person wrongfully arrested for a well-known murder in Bristol. If this all sounds quite heavy, Breaking Strings has its fair share of laugh-out-loud comedy. “I Love My Phone” will ring too true for many smartphone-widows and widowers. My own girlfriend, who, to her detriment, isn’t equipped with Google Maps, reckons that it may well have actually been inspired by her attempts to distract me from my iPhone. At face-value, “Song for Europe” sounds like a BNP anthem, but it applies Carrsian postmodern irony to comment upon xenophobia and stereotypes. The song concludes, though, with a rather pertinent point that might cause any inadvertent BNP listener to choke on his pie. Elsewhere, we have a Brian Cox-inspired song about Quantum Mechanics, and “Lullaby for the Real World” provides two minutes of unrelenting pessimism remoulded into fun naughtiness. Credit should also go to the two members of The Distractions, bassist Kirsty Newton and drummer Ivan Sheppard, whose contributions add some depth to the production. Newton and Sheppard also tour with Benn and regularly contribute to The Distraction Club, a regular music and comedy show at The Phoenix in London’s West End. Although most of these songs fit well in album format as standalone tracks, the expository mini-stand-up that Benn offers on The Now Show, at gigs and when offering songs on his website is occasionally missed. For instance, you might be left wondering why a song about The Queen Mother follows conventions of Jamaican music, with lyrical references to Bob Marley. Perhaps an introduction in the liner notes could have subtly explained the less obvious references. It wouldn’t surprise me, though, if Mitch has already considered this idea, and constructed an articulate argument against it with references to a range of precedents. All in all, Breaking Strings is quite an achievement. Even the classy cover art, featuring Benn’s two young daughters, indicates maturity. Although Mitch has always offered clever wordplay and catchy hooks, Breaking Strings is also consistently sophisticated in tone and intention. Graduating from rather innocuous Radio 4-friendly fare, such as transposing Macbeth into a rap and targeting Elton John for always being on the telly, Breaking Strings says important things in a craftsman-like way. While still being damn funny. Breaking Strings is released by Laughing Stock on 12th March 2012.